During a sit-in at the U of C hospital protesting the lack of an adult trauma care facility, UCPD arrested four protesters when the sit-in became violent. Students at the protest described UCPD pulling the protesters to the ground and hitting them repeatedly. The arrested protesters included the cameraman for the protesters, two members of Fearless Leading the Youth (FLY), and a graduate student. The Arts Incubator opened on East Garfield Boulevard and South Prairie Avenue. At the opening ceremony, President Zimmer described the project as a way for the University to “positively represent ourselves as active partners to these communities.” The Arts Incubator has programs for exhibitions, performances, and local arts education. The University hopes to expand the Garfield “arts corridor” in years to come. A Facebook page, “Politically Incorrect UChicago Confessions,” provoked an outcry and a gathering of more than 75 students and administrators upset by racist, homophobic, and sexist remarks shared anonymously on the page. Offended individuals gathered in a forum at the Office of Multicultural Student Affairs (OMSA) to discuss strategies for supporting a safe environment for all University students. IOP Opens, Marking First Full Year of Programming The Institute of Politics (IOP) officially opened in January 2013, making the 2013–14 year the first full academic year during which the Institute provided speaker events programming, career resources, seminars, and workshops for students interested in politics. 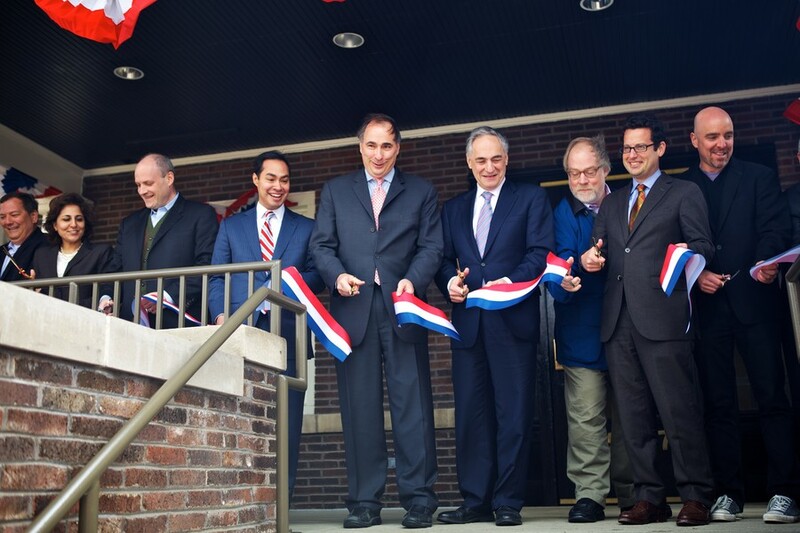 Founder David Axelrod stressed the nonpartisan goals of the Institute, and told The Maroon he envisioned the IOP as an “ROTC for public service.” Since its opening, the IOP has played host to a number of high profile guests, including comedian Jon Stewart, 2016 presidential candidate Bernie Sanders, Trump campaign manager Corey Lewandowski, press secretary Sean Spicer, and House minority leader Nancy Pelosi. Eugene Fama and Lars Peters Hansen shared the Nobel Prize in Economics with Robert Shiller of Yale, for their research on the predictability of asset prices. They developed statistical tools to test price forecasts, and complicated the efficient markets hypothesis with data that had practical applications for financial markets. In a rare occurrence, the University declared snow days on Monday, January 7 and Tuesday, January 8, due to students’ inability to return to campus on time after winter break in the wake of a massive snow storm and record low temperatures. The University announced its plan to close five satellite dorms with the opening of Campus North Residential Commons: Blackstone, Breckinridge, Broadview, Maclean, and New Graduate Residence Hall. It later sold Blackstone, Broadview, and Maclean, spurring protests by satellite dorm residents who believed the changes would thwart house culture. In response to several students who dressed up as cholos, or stereotypical Mexican gangsters, for Halloween, two undergraduate students penned a statement asking the University to condemn the students’ actions and address the racial climate on campus. The statement, written by Vincente Perez and Jaime Sanchez Jr., challenged the University’s stance on freedom of speech and expression and was supported by multiple RSOs and professors. The university faced an investigation by the U.S. Department of Education’s Office of Civil Rights for its potential breach of Title IX in its handling of sexual assault. Three months later, the University created an Associate Dean of Students position to handle campus sexual assault directly. During an event at the IOP with political columnist Ana Marie Cox and the founder of the It Gets Better project, Dan Savage, Savage discussed his personal experience as a gay man and used a transphobic slur in an anecdote about reclaiming words. When a student at the event asked Savage to use the term “t-slur” instead, Savage named other slurs and started a tense dialogue about the usage of slurs and gender identification that resulted in the student leaving the room in tears. After both Cox and the IOP stood by Savage’s comments, students in the LGBTQ+ community started a petition calling for an apology from the IOP. SG announced that full-time undergraduate students will receive bus and rail rides on the CTA in a new U-Pass program. Supporters of the program explained that it was an opportunity for students to explore Chicago in depth, while critics argued that the $250 annual price tag was expensive and unrealistic. Gun Threat Cancels All Class and Activities (November 29) All classes were canceled after an individual posted a shooting threat online on the Sunday of Thanksgiving weekend, allegedly in response to the 2014 shooting of Laquan McDonald. The University employed extra security and worked with the FBI to investigate the threat. By Monday afternoon, a UIC student was arrested and admitted to posting the threat. No guns were found in his apartment. Classes resumed on Tuesday. After five years of protests, UChicago Medicine announced that it would open a Level I adult trauma center. Community activists demanded that UCMC create the facilities to help accommodate trauma victims on the South Side, a historically underserved area for medical care. The protests picked up speed in 2010 when one young community organizer was shot three blocks away from UCMC, but died en route to Northwestern Memorial Hospital. The trauma center is scheduled to open in 2018. In January 2015, two gunmen killed 12 at the French satirical newspaper Charlie Hebdo’s office in revenge for the paper’s satirical cartoons against Islam. The newspaper’s Zineb El Rhazoui spoke at the University in February about the attack and free speech. The school had to increase security after El Rhazoui received death threats online. During the Q&A portion of the event, then fourth-year Aseal Tineh criticized Charlie Hebdo for its portrayal of an already-marginalized Muslim population. El Rhazoui argued that not everyone had “the balls” to say they stood with Charlie Hebdo, and that Islam has bigger problems than Charlie Hebdo. A group of approximately 35 protesters interrupted a seminar held by Cook County State’s Attorney Anita Alvarez at the IOP, causing Alvarez to stop the event after 20 minutes. According to a press release from Black Lives Matter Chicago, the protesters accused Alvarez of perpetuating “state violence against Black and brown people in the City of Chicago,” not holding police officers accountable, and being criminally negligent to the well-being of Chicagoans. This protest has served as the basis for ongoing debates about free speech and disruptive on UChicago’s campus since then. The University announced the appointment of Daniel Diermeier, then-dean of the Harris School of Public Policy, to the position of University provost. A former professor of business and public administration, Diermeier has taught at Stanford and Northwestern Universities and is the author of two books. College Council voted to pass a resolution urging the University to divest from 10 companies said to enable Israeli human rights abuses in Palestine. Discussion took place before the vote in a crowded room in Stuart, with supporters waving signs and Palestinian flags and opponents wearing T-shirts that read “yes to peace, no to divest, no to BDS [boycott, divestment, and sanctions].” Intense debate ultimately led to eight votes for the resolution, four against, and three abstaining. The vote proved controversial, with UChicago Coalition for Peace and JStreet UChicago posting lengthy statements opposing the decision online. The University switched dining providers from Aramark to Bon Appetit for the 2016–17 school year. Aramark had been the dining provider for the University for more than 30 years, according to a statement by Aramark Vice President Karen Cutler. On the eve of his graduation, then-SG President Tyler Kissinger was placed on disciplinary probation for using his title to allow protesters into the fifth floor lobby of the University president’s office. Nearly 200 professors, 3,276 students, and a tweet from Bernie Sanders voiced support for Kissinger, who graduated the next day. The Obama Foundation announced that Jackson Park will be the site of the Obama Presidential Center. “We are proud that the center will help spur development in an urban area and we can’t wait to forge new ways to give back to the people of Chicago who have given us so much,” Obama said in a statement released by the Obama Foundation. Aside from the president’s personal involvement with South Side community development, considerations in the decision included the neighborhood’s proximity to Lake Michigan and to the Museum of Science and Industry. The project aims to bring new jobs and resources to the community. A letter was sent to all incoming students in the Class of 2020 that expressed the University’s commitment to freedom of speech. In the letter, Dean of Students in the College Jay Ellison wrote that the University does not condone “trigger warnings” or “safe spaces” that may shield students from exposure to ideas they do not agree with. This statement was released in response to the previous year’s disruptive protests, which interfered with multiple IOP events. The University received nationwide media attention for its stance on the issue. Campus North Residential Commons was officially unveiled five days before first-years moved in. Jeanne Gang, founder of Studio Gang Architects, and David Clark, assistant vice president for campus life, emphasized the importance of student needs to Campus North’s architecture during a media tour. “The house hub is the kernel that generates all of the dimensions,” Gang said. The University jointly filed an amicus brief with 16 other universities following President Trump’s unilateral decisions to bar travel into the United States to citizens of seven Muslim-majority nations and to restrict refugee admission. The brief stated that the executive order would create significant hardship for international students and limit the diversity of perspectives on campus. Former President Obama moderated a discussion panel in Logan Center for the Arts with six students and graduates of Chicago colleges to discuss the political mobilization of today’s youth, the role of media in the internet age, and the prospect of bipartisanship in national politics. UChicago was represented by third-year Max Freedman. Two student groups, Graduate Students Union (GSU) and Student Library Employees Union (SLEU) filed petitions to the National Labor Relations Board for union recognition. The University has filed against graduate student unionization, and legal representatives of the University and GSU affiliates are currently debating the matter at ongoing hearings downtown. SLEU has won the right to unionize from the NLRB and will hold an election in June. Six multicultural student organizations signed a letter accusing Phi Gamma Delta (FIJI) fraternity of hosting a “racially insensitive” party on Cinco de Mayo. The event was originally named “Fiji Presents: ‘Get Hammered,’” fraternity members were found wearing construction uniforms, and a brother posted on the party’s Facebook page, “What’s the mustache policy for tonight? Asking for an amigo.” FIJI responded to the allegations in an open letter shared on May 9, denying intentional connections between Cinco de Mayo and the party’s construction theme. The Council of the University Senate passed a revised disciplinary policy on disruptive conduct in a private meeting. Disruptive conduct includes actions like obstructive protests and silencing speakers on campus. The updated policy includes warnings, probation, and, in the most extreme cases, expulsion as punishment for its defined range of instances of disruptive conduct.